In the 14th and 15th centuries, plague and wars gave Death a central role in art; the Danse Macabre is an important subject in medieval iconography. Recently I got to visit one spectacular example in Slovenia. The innocent Child pulled from his crib, the Beggar with his prayer beads, the Loyal Soldier... death will take us all. In the middle of our recent visit to Bulgaria, the Maestro was summoned to Klagenfurt, Austria to discuss a new commission. A side trip within a side trip, our host Gerhard Lehner, tossed us into his van and drove us to nearby Solvenia to see the marvelous Totentanz of the little church at Hrastovlje, on the Istrian peninsula. The Banker offers his bag of money and Death laughs. The Doctor's medicine is likewise useless. Cerkev Svete Trojice (Holy Trinity Church) dates from 12th century and is built in a unique Romanesque style. 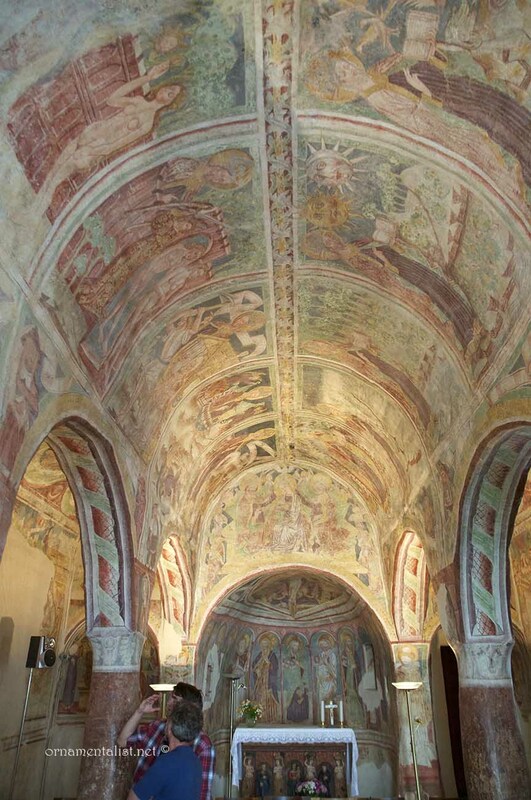 The now-famous frescoes were painted by Johannes de Castua and his atelier and completed in 1490. The Monk, the Bishop, even the Cardinal... we all have to go sometime. For a nominal fee photography without flash is allowed. It never hurts to ask! The docent inside the church told us that owing to the plague in the 16th century, the walls were "covered in white sheets" (whitewash) and the entire town was burned and for a time, abandoned. 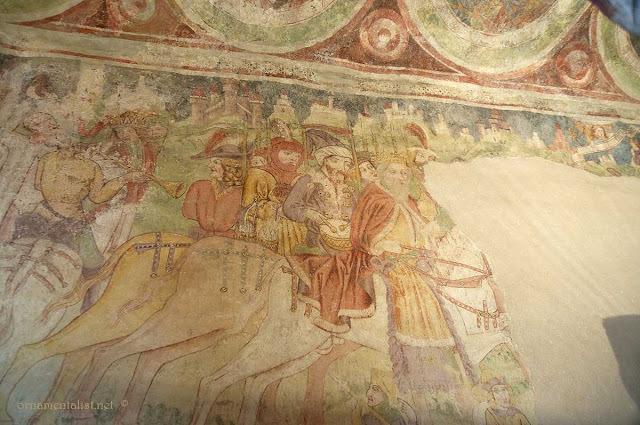 Centuries later, after WWII, the whitewash was removed and the frescoes, discovered to be in very good condition, were cleaned and restored. On the ceilings and elsewhere in the church, colorful frescoes with scenes from the Bible; the months of the year; portraits of saints; faux marbre columns with simple trompe l'oeil capitols; and stenciled borders embellish every available surface. But most people come to see the Mrtvaški ples, the astonishing rendition of the Dance of Death. Here is the Queen and the King, all of us are equal in the end. The Pope, at the front of the parade, the grave is waiting and Death welcomes all. Graffiti scratched into the walls was also preserved, some of which makes disparaging remarks about the King. 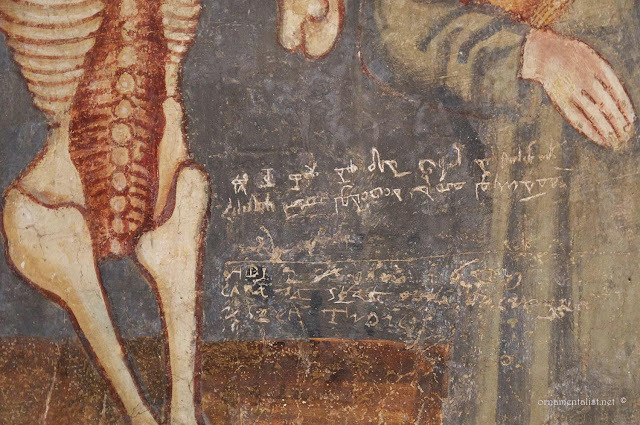 An inscription crediting the artist: "Hoc opus fierit fecit Tomic Vrchovich de… magister Johannes de Castua pinxit" is repeated in latin and in the old Slavic Glagolitsa. 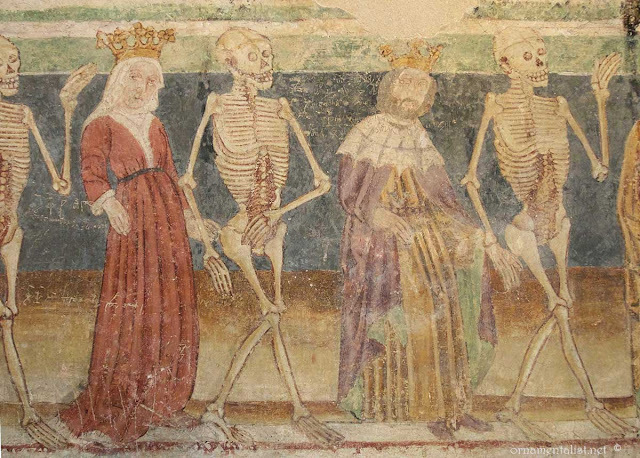 Though the church interior is early Gothic in its design, the influence of Renaissance Italy is apparent in the murals. Our day continued in a big loop through Koper, Trieste, and Aquileia, a day from which I am still recovering! 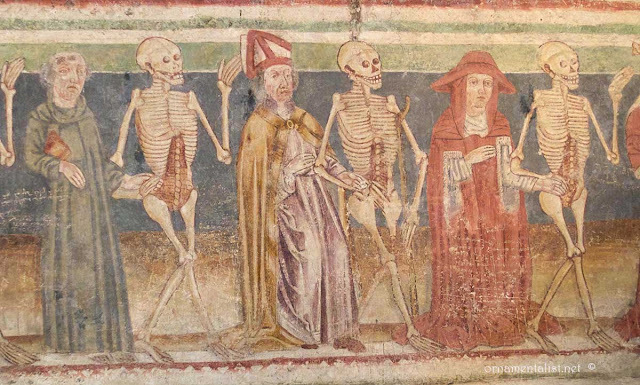 What an interesting day you had — the story of the whitewashing and abandonment must bring viewing the dance of death paintings to a more raw reality. Thanks for sharing! There is some pretty scary stuff in that church. Thanks for the tour. Richard from My Old Historic House. You really scored on this trip! Although macabre, the interior walls are incredible.So glad you were able to "legally" photograph this! Cool link, Martha 2.0, thanks. yes it's true the Turkish raids and subsequent Ottoman occupation of Bulgaria and the Baltics resulted in a lot of churches being whitewashed and even repurposed as mosques, (and I suppose the same could be said of certain mosques destroyed by crusaders during the same period) but this was not one of them. This one has an 8 metere high wall that effectively protected it from such raids, until the plague wiped out the whole town, and it was felt that whitewashing church would somehow clean it. However, it was the same task force in the 1950s that restored this church as those that had been damaged for other reasons: Ottoman whitewashing; Nazi looting; damage from bombing and fire; hundreds of years of candle smoke, etc. What a trip! Very cool that you went off the beaten path and can show us sites we'll probably never see! 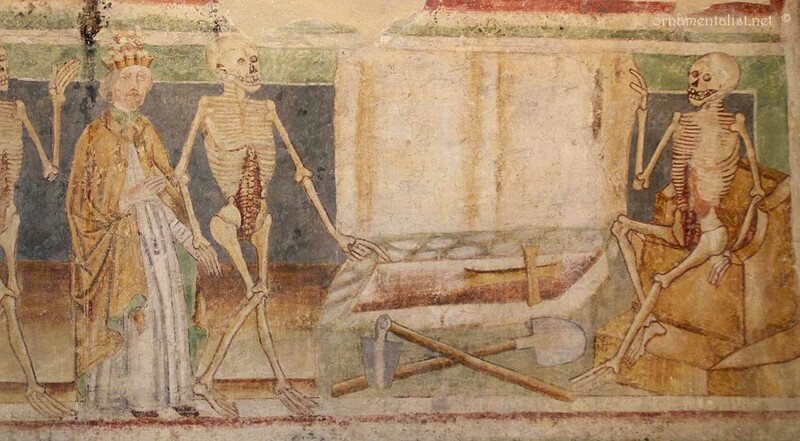 Anything fresco is beautiful in my book, although macabre, as Theresa described it. Looks like an amazing space. I like the "day of the dead" style of the skeletons- realistic, but.... Weird to think of how familiar most people then would have been with dead bodies. that Glagolitsa script is certainly odd looking! thanks for the link. Thanks for sharing a fantastic trip. I have noticed that all the skulls are very similar in shape, proportions and design. They probably used some kind of template . This whole thing is about life, death and metaphysics in the end but the craft brings all down to earth.Funny. good observation, Pascal. I spent a good hour trying to list all of the techniques involved and I noticed a lot of stenciling in this church, and also the larger murals have many repeated elements - for example the fabric in the more splendid robes are of the same pattern, but painted in different colors. According to our guide, very similar murals appeared in other churches painted by this atelier, although non survived WWII. 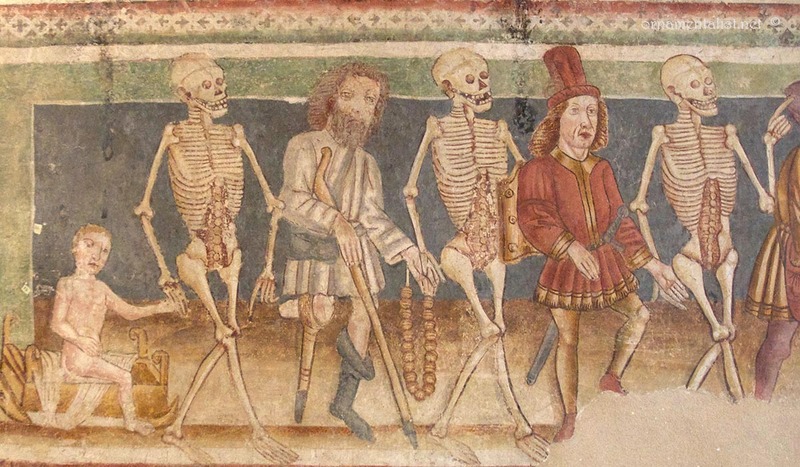 It was common practice for church painters to go from one commission to the next using the same cartoons and stencils. 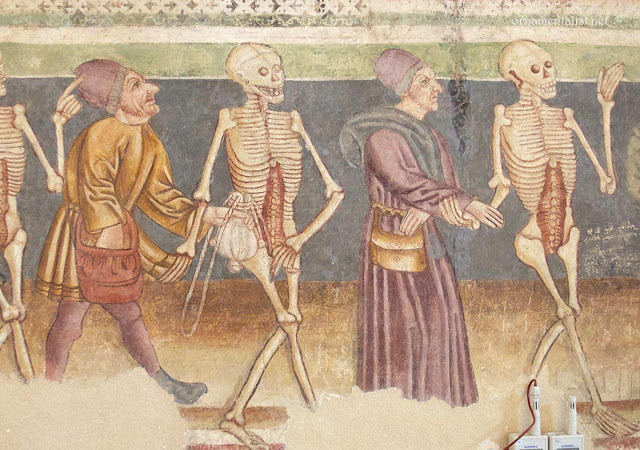 Thanks so much for this post; I teach courses on the late medieval period and use danse macabre images often, but I was not familiar with this example. Great images.